Pearl the Proper Unicorn is the third in the series about Pearl, Olive and Tweet and their adventures in the Kingdom. In this story, Pearl is astonished when she meets another unicorn. She's always been the only one in the Kingdom! Percy is passing through on a quest, and he magnanimously agrees to help Pearl to master her magic. The problem is, Percy is convinced there's only one way to do things- his! Naturally, Pearl and her friends come out on top, but Percy's not a bad sort- at least he can admit it when he's wrong. 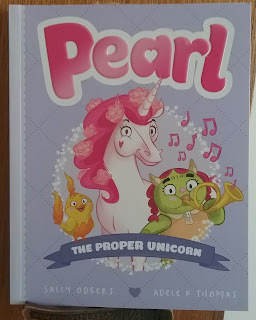 Pearl the Proper Unicorn is my second published book for 2019... The purple cover joins the blue and pink ones of the first two books.